In the first five months of 2014, measles cases reported to the U.S. Centers for Disease Control and Prevention (CDC) have exceeded those reported in all of 2013. Many of these cases were imported by travelers who had become infected in the Philippines, where approximately 20,000 cases have been reported and 69 people have died. Travelers coming from Canada, India, Singapore, Vietnam and western Europe have also brought back the virus and spread it at home, school, on airplanes, in daycare centers and other locales. Jeffrey Duchin is a UW professor of medicine in the Division of Allergy and Infectious Diseases. As of March 15, Washington state had reported 14 cases. The patterns of these outbreaks underscore the importance of vaccination, says Dr. Jeffery Duchin, chief of Communicable Disease Epidemiology & Immunization Section for Public Health-Seattle & King County. He also is a UW professor of medicine in the Division of Allergy and Infectious Diseases. Duchin sat recently for a Q&A. Q: Newsbeat: Where have the infections in Washington state come from? Q: What should people do if they develop a fever and a rash and think it might be measles? 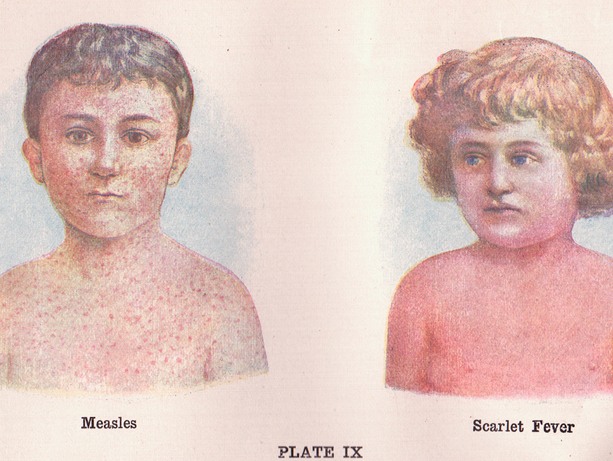 Measles usually makes you feel significantly ill. Symptoms include a high fever, conjunctivitis, runny nose and cough. The typical rash starts on the forehead and spreads down to the trunk and extremities. If someone who has not been vaccinated has symptoms like that, especially if they have traveled to areas where there have been outbreaks or have been exposed to someone who has traveled to those areas, then measles should definitely be considered right away. But if you don’t have the exposure history and you’re vaccinated, the likelihood of getting measles is extremely small. Even if you only got one dose of the vaccine instead of the recommend two, your risk is still very low. In most cases, treatment involves rest, fluids and acetaminophen for fever. Aspirin should be avoided for anyone under 18 because of a serious complication called Reye’s syndrome. For patients at high risk for serious complications – infants, pregnant women and those whose immune systems may be compromised – immune globulin (antibodies) is usually given to help them fight the infection. Q: Who is at highest risk of serious complications from measles? Q: How effective is the vaccine? It’s one of our most effective vaccines, studies have shown it to be about 95% protective with one dose and 99% with two. But, still, it’s not 100% protective, and it is possible that over time some of the protection may decrease. So there’s a very low chance that you could still get measles even if you’re vaccinated. But in that case your symptoms will tend to be less severe and you’re less likely to spread the virus to others. Q: Who should be vaccinated? Everyone 12 months and older who doesn’t have a contraindication, such as being pregnant, immunocompromised or being allergic to the vaccine, should be vaccinated to protect themselves and those around them. And anyone who plans to travel abroad or who frequents airports, where international travelers pass through, should be sure they received two doses of the measles vaccine. Children between 6 and 12 months who are going to be taken abroad should be vaccinated. This will give them some protection, and then they can have their regular dose when they reach 12 months. Finally, healthcare workers, including those in outpatient settings, should be fully immunized. If a case comes into your clinic or emergency room, there’s a good chance you will be infected if you are susceptible. The virus stays in the air and can still infect you for two hours after an infected person has left a room. It’s one of the most contagious viruses we know. If a health worker who doesn’t have a documented history of immunization is exposed, it can mean being furloughed from work until their measles immunity is established. We’re fortunate in King County that we have a highly immunized population. This is the main reason why, so far, cases we’ve identified have been limited to travelers and we haven’t seen bigger outbreaks. It’s important to remember that measles has a way of seeking out pockets of unvaccinated persons and spreading even in highly immunized populations and spreading among them, which also places the general population at risk.